Having a tooth removed is nobody’s idea of a good time. But situations arise that make tooth extraction the best, and sometimes, only option available. At Precision Dental, we want our patients to enjoy a healthy, attractive, full set of the original teeth and we do our utmost to preserve and improve the strength and beauty of everyone’s natural dental assets. In the past, pulling teeth was the nuclear option, the cure all treatment, for many dental conditions. 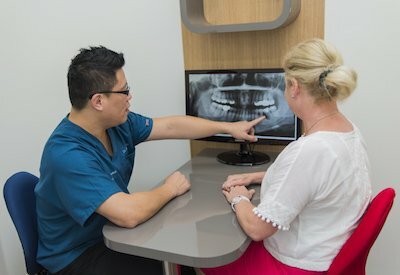 Thanks to modern, scientific dental practices, it is now possible to repair the vast majority of dental problems without losing the original tooth. Tooth extraction is one of the most basic and fundamental of all dental procedures. It may not be as glamorous as some contemporary dental procedures, but it is still a common procedure that every dental professional should be able to perform efficiently and safely. Will it hurt? Of course … NOT! The most painful part of the procedure will be the minor discomfort from the application of the local anaesthetic. The professionals at Precision Dental will make this part of the procedure as mild as humanly possible. The anaesthetic will numb the entire area of the extraction so that the actual tooth removal will be painless. In general, recovering from an extraction procedure is easy and simple. Your recovery will depend on the ease or severity of your particular procedure. The more complex or difficult your extraction was, the longer your recovery will take. We will guide you through all of the procedures, and even in more severe cases, recovery is not something to worry about. We will give you precise instructions on how to care for your mouth post-procedure, to facilitate the safest and fastest recovery possible. Follow the instructions diligently. Most people recover from all pain in one or two days. After about a week, most people can stop taking special considerations with the extraction zone and return to eating and drinking normally. Should any unexpected problems occur, we are always ready to re-examine you and take whatever steps necessary to make sure that any problems are dealt with quickly and safely. Your health is our highest priority. Feel free to ask about any concerns you have. We are happy to answer all your questions and want you to be relaxed and comfortable.